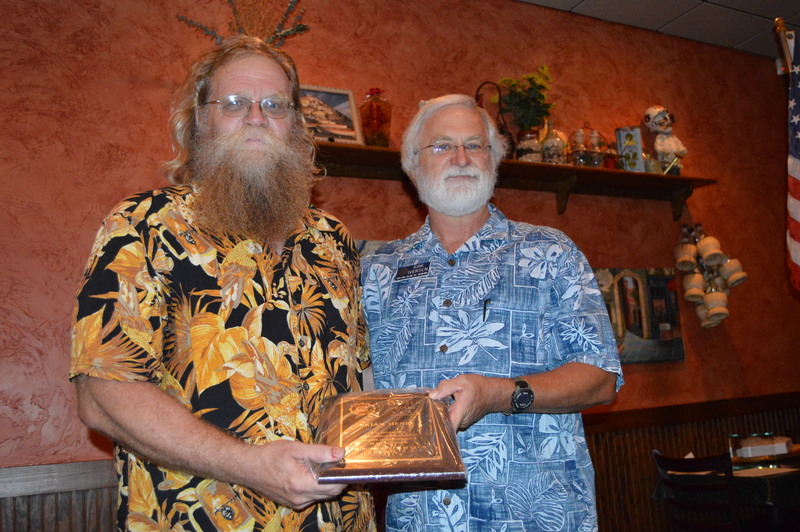 Brian Henry (l) receives Citizen of the Year award from Kirk Iversen (r). The Citizen of the Year Award recognizes residents of the Auburn area who have contributed their time and efforts for the betterment of the community above and beyond contributions made to their employer. Such contributions must be of a meritorious nature, rendered unselfishly to community needs. One of the Auburn Civitan Club’s most noteworthy projects has been the 4th Grade Bicycle Safety Education Program, in which every 4th grade student in the Auburn City Schools receives training in bicycle safety. Sponsored by the Auburn Civitan Club, the Auburn City Schools, and the City of Auburn, a fourth pillar of the program has been Brian Henry. Brian has contributed to this project since it began in 1999. He helped select and obtain the original bicycles purchased for the project and others bought later for expansion and replacement. Every summer, and throughout the year as needed, Brian services the bicycles on his own time and without compensation to keep them useable for the students. The Bicycle Safety Program would not be the success it has been without Brian’s essential contributions. Brian (aka “The Bike Dude”) has also been greatly involved in other bicycle projects in the community. He has been a major part of the Auburn Bike Bash (another project supported by the Auburn Civitan Club) since its beginning in 2000, providing materials and tune-ups for riders each year. He has also provided materials and expertise for a City of Auburn program for disadvantaged kids who learn to rebuild and maintain donated, second-hand bikes and then keep them. These and other contributions to bicycling in the Auburn Community were recognized by the Auburn Bicycle Committee when Brian received the first Friend of the Bicycle Committee award in 2004 (the Auburn Civitan Club was a recipient in 2007). Brian’s citizenship contributions are not only within the bicycling community. He has been greatly involved in community’s youth baseball program, serving as a coach and member of the Board of Directors for many years.